Mass. will have early voting for the first time this year. But are we ready? A man voted in Salem two years ago. 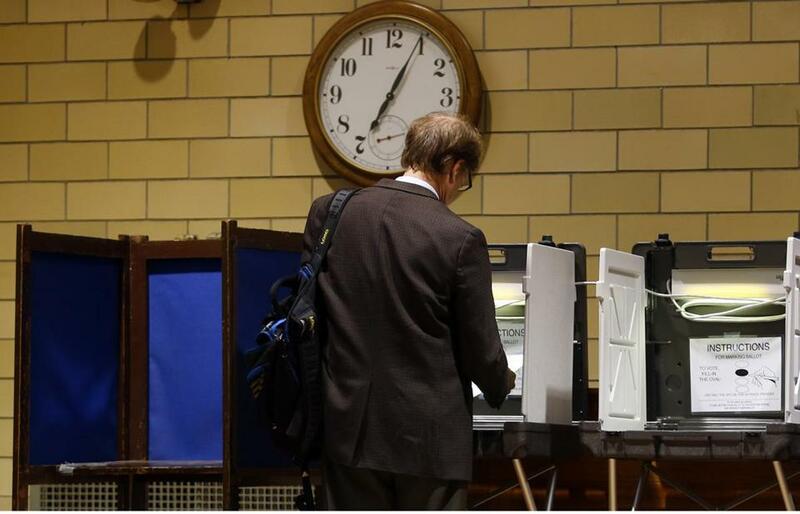 Fewer than half of the state’s cities and towns have finalized plans to provide early voting options — newly required by state law — when Massachusetts residents go to the polls in November, according to a new survey from a coalition of public interest groups and voting advocates. For the first time, communities are required to open voting locations during the 10 business days leading up to the week of the election in November, starting this year. In interviews, some town clerks have predicted the early voting process would go smoothly, but others said they are waiting for Secretary of State William Galvin’s office to release finalized guidelines on early voting, holding up their own planning processes. Thirty-six other states have some kind of early voting this fall, according to the National Conference of State Legislatures. The law is designed to make sure that people who cannot get to the polls on Election Day are not denied the right to vote. For some towns, Galvin acknowledged, there has been a “learning curve” and a “fair degree of lack of awareness” about early voting, though he says his office is working to clarify the procedures. Preliminary recommendations were vetted last month at a public hearing, and Galvin said he will soon release a finalized set of guidelines. But a new survey released Thursday by the Election Modernization Coalition — a group that includes Common Cause Massaschusetts, the League of Women Voters of Masschusetts, and the American Civil Liberties Union of Massachusetts, among others — showed a large number of the state’s communities are still early in the planning process, if they have started at all. The coalitioncontacted each of the state’s 351 cities and towns by phone. Of the 313 communities they were able to reach, 138 had nearly finalized plans in place, while 126 had tentative plans — a category that yielded responses ranging from “not yet sure” to “considering” certain options. Forty-nine municipalities from across the state had not started planning, the report said. “We are here today to ask them to step up,” saidGavi Wolfe, legislative counsel at the state ACLU, at a Thursday press conference to present the coalition’s report. Municipalities must submit final plans for early voting to the secretary of state by Oct. 10, although votingadvocates say election officials should be prepared far before then. Galvin said he has pushed the Legislature to enforce an earlier deadline. The law, originally signed by Governor Deval Patrick in 2014, applies to the November elections held every two years. This year’s early voting period begins Oct. 24 and ends Friday Nov. 4. The coalition conducted its survey between June 9 and July 20, and members emphasized the data is preliminary. But Pam Wilmot, executive director of Common Cause Massachusetts,expressed frustration that Galvin did not release initial guidelines for communities to set up early voting until May. “We had pushed starting last summer for the guidelines to come out in the fall of last year, because so many communities really were waiting and looking for guidance,” Wilmot said. Galvin said he is not concerned that many municipalities have yet to finalize their plans. He said his office has conducted a survey of the state’s cities and towns and is currently reviewing responses. In some instances, Galvin said, he asked communities to revise their plans to improve them. Some 75 cities and towns have also asked his office to visit potential polling sites to determine if they are large enough, Galvin said. In addition, Galvin said, it would have been “a matter of conjecture” to release a set of guidelines earlier than he did, in part because many cities and towns were still waiting to approve their budgets. “I think the timeline is realistic,” Galvin said. State law requires early voting for the general election but not the state’s Sept. 8 primary, which could cause some confusion among voters, election officials said. Though the state will finance early voting ballots, cities and towns must foot the bill for other potential costs, such as overtime pay for staff members working extra hours. Galvin said that based on his office’s survey, he has reached out to a number of municipalities and offered to help pay for additional voting sites if necessary. Boston plans to have nine early voting sites running simultaneously on Saturday, Oct. 29, in addition to “one day” sites open during the week. City Hall will be the main early voting location, and the city will spend more than $600,000 to facilitate the process, according to Sabino Piemonte of the Boston Election Department. The Election Modernization Coalition said it has encouraged municipalities with more than 35,000 residents to use more than one polling site. But Wolfe, of the ACLU, said only eight cities that size or larger had indicated they planned to open multiple sites. Carol Ann Desiderio, assistant registrar of voters for Malden, which has a population of around 60,000, said her office originally intended to use City Hall as its early voting site but then realized the space might be too tight. Now they are deliberating on where to hold early voting. But Malden probably will have only one location. “It’s just the early stages of planning,” she said. Early voting became the center of a funding battle at the State House last month, when Governor Charlie Baker vetoed $1.2 million that would help the program. House and Senate lawmakers later voted to restore that funding.